oh man, I love the Mormons. I recently had a Bishop come over and discuss some things with me. awesome conversation. I’ve had numerous conversations with Mormons, but I never came across this list. Ok, but more seriously…I would just wait to see how the Mormons applied these criteria. I often hear the matthew 7 passage (fruits you will know) often, and they will say something like, “If the Mormon church is the true church, then you will recognize it by its fruit. They have many fruits (theyre amazing when it comes to community service), therefore theyre the true church.” This affirms the consequent. And if this is how they all apply these criteria, then their application is incorrect. And I have a feeling theyll do something like that too. i have to get them to say the “if-then” statements, but its well worth the small effort. One mormon guy said I was calling Jesus a liar then. lol. he wasnt getting it. but then i guess Id move on. I would agree with certain issues, like 1,7, and maybe 14 to find common ground. the rest of the issues i think are false, but 2, 4, 6, 12, 13, & 16 might not be worth the effort. the rest i think are more important, and should focus on those. number 8, i think this contradicts what they believe for baptism. as someone who also believes in baptism being “necessary” for salvation, i also believe you get the gift of the holy spirit at the time of baptism (acts 2:38). If this is so, then the laying of hands is totally not necessary for the gift of the spirit since you get it at baptism. number 9, especially when lives could be at stake. these gifts given to the apostles could not be passed on. they were given to the apostles to establish the church being from God. Only up to a point. it wasnt supposed to last more than a generation or two. number 10, omg..Jesus IS God. How many verses can i cite for this one?! but then, i guess it can get tricky because we can use the same terminology and have different definitions. They might say Jesus is not God, but then say, according to eternal progression, Jesus is God. So I can see this branching off quickly. I dont know the first thing on how to handle it after that point. number 11, God is spirit, therefore worship in spirit (john 4:24, luke 24:39). After living in Utah for 8 years, and now a border town with a high mormon population, I have had conversations on these points many times. Typically they do not bring up the whole list at once, it is primarily a means to teach their own followers in order to convince them they are following “the true church”. Missionaries often try to avoid some of these subjects when presenting their version of the gospel because they are impossible to defend. I will take on only a few of these 17 points. On point 2, this is how they eliminate most other churches. However, even the churches that were contemporaries of the apostles did not bear a name which named Christ. Each of the churches was named for it’s geographical location and that is how they were addressed in the bible. They will more then likely claim that it is because the 13th tribe they attest to have existed was the only one who bore this name, and the churches of that time were already apostate. On point 3 the text reads “the apostles and prophets” not “a foundation of apostles and prophets”. This may seem like splitting hairs, but it makes the point that the apostles and prophets were referred to in present tense, meaning they were alive at the time, or already known of at the time. It is not referring to “a” group, but the specific group. On point 9, again this refers to a specific group of 12, not any other group of 12. As well, they were appointed by Christ himself, not men. 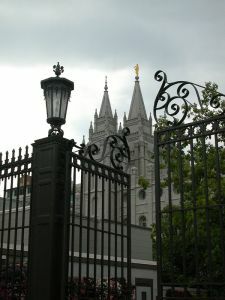 The mormon church would claim God appoints their apostles, however they believe God and Jesus are not one in the same. This being the case, since Christ is not chose the 12 this scripture cannot be applied to their practice. We believe this means that God did the choosing, but they would not be able to claim this without admitting Christ and God are one in the same. On point 12, Exodus 40:13 refers to the anointing of the tribe of Aaron. The mormons believe that all reference to the 13th tribe, who they claim was the true tribe, was wiped clean from the scripture. This anointing then was not given to the fictitious tribe they claim was the true church since it is given to the tribe of Aaron. They would need to decide that the tribe of Aaron was part of the true church, or this anointing wasn’t given to the tribe they claim was wiped clean from scripture. On point 16, the passage used is not a positive support of this practice, but said in reference to those who practice it, and it’s futility. The practice is only known to be practiced among heretics. The mormons would likely claim that these “heretics” as we call them, are the true tribe they refer to. In addition, the dead is anyone not in Christ, spiritually dead, not physically. So the baptism of the dead would be the practice of baptizing those who were not in Christ, a futile effort since baptism is only useful to those in Christ. In addition, they cannot claim these heretics are those of the 13th tribe, because they also claim all reference to them was wiped clean of scripture. So either they are heretics, or a tribe they claim has been wiped clean from the writings. Either of these options causes them a problem. On point 17, the “fruits of the spirit” are not works, as they would refer to them, but are traits within the person. Is the person joyful, loving, do they live in peace? Are they patient in affliction, kind, good and gentle? These are not works, but an inward change. Works are simply part of the evidence to these inward traits, not the traits themselves. On point 10, this is one of the most difficult issues of mormon belief. They simply do not believe that Christ is God. The only response to this I have ever fund useful is explaining who I believe Christ is in comparison to who they believe Christ is. For example, they believe Christ required his own salvation, is not unique, was a polygamist, and a spirit brother of Lucifer. The only solution is to point out the biblical passages to the contrary. They will claim they believe in the biblical Jesus, but when faced with the truth of scripture, they are forced into a crisis of belief. By carefully noticing the pronouns, one can see who was actually practicing baptism for the dead. Paul says, “…what shall they do which are baptized for the dead… why are they then baptized for the dead?” Paul did not say, “Why are you (Corinthian Christians) then baptized for the dead?” He did not say, “Why are we (the followers of Christ) then baptized for the dead?” He did not say, “Why then am I (Paul himself) then baptized for the dead?” He was asking, in effect, why these false teachers, who did not even believe in the resurrection, would want to baptize for the dead if the dead do not rise at all. I don’t know what to reply to any of you!! Other than you need to pray about what the Mormons teach. I have known, lived around them for years and find them to be very solid citizens. When missionaries teach you they don’t force anything on anyone, they simply ask you to pray about the things they have taught you. However, it goes without saying, you must be sincere when you pray to God. Another thing when one is completely secure in their beliefs, bashing others doesn’t even come into their minds. I love the Mormons. Many have told me, “If, and that is a big “IF”, I have made a mistake in believing these teachings, it has been the best mistake in my life”; because this gospel teaches me to love everyone and accept and respect their beliefs. It has taught me the importance of paying tithing (10% of your gross income), it has taught me that Heavenly Father knows us by name and watches over us. The list is to long to address them all. They are prayerful people. I also know that the FBI in any state, hire members of the mormon church because they know that they are people of integrity, honesty, etc., etc.. Now, you might ask yourself why they are people that are respected. You get to know them and you will know why…its the teachings they live. You take care of yourself and pray before you make comments of a church you know nothing of. And, YES, I will be baptized in their church soon. At issue is not the honesty, integrity, or morality of Mormons. After 19 years of “investigating” the LDS Church, to include reading ALL of its scriptures and extensively into the early teachings of its “prophets” (see Journal of Discourses), and comparing it to the Bible’s teachings, I conclude the LDS are a false church. Sorry, if I want to discuss what the Bible really says and compare it to what the LDS church teaches, and if I worry about the eternal salvation of my Mormon friends and family, I guess that makes me an “anti-Mormon.” But hey, I served in the U.S. military for 22 years to help guarantee your freedom of worship, so “you’re welcome,” and thanks in advance for labeling me without knowing me.